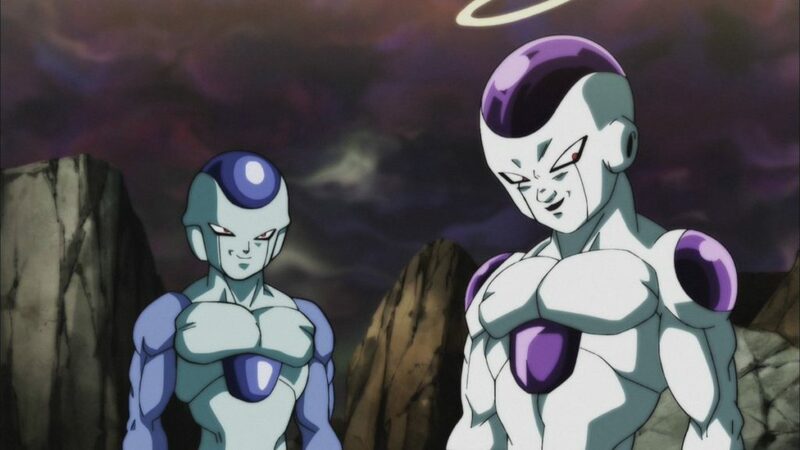 Dragon Ball Super has aired another six episodes, would you believe (well, since you’ve seen the title and clicked on the link, I guess you would believe), so, for those not in the know, a quick recap: eight of the twelve universes are on the verge of being completely erased from existence, their only hope to survive is if their team of 10 warriors come out on top of this 80-fighter battle royal. People are eliminated by being thrown out of the large arena, and so far Universes 9 and 10 have been wiped from reality. 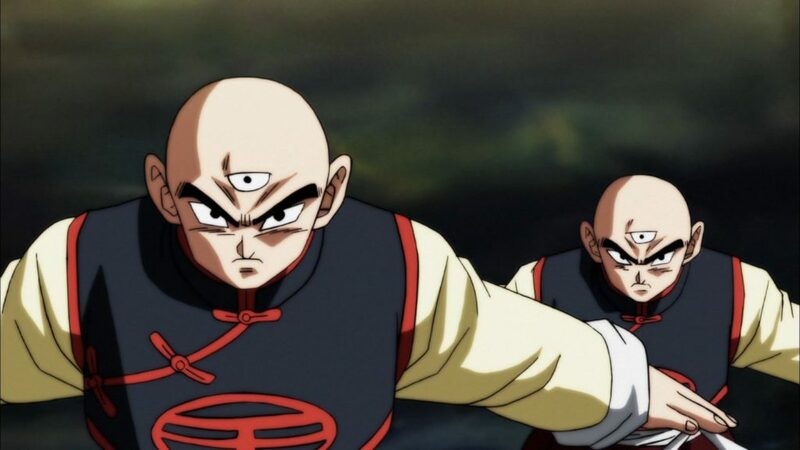 Episode 106 sees Gohan and Piccolo pinned down by a duo of warriors acting like a sniper (one person fires a thin beam of energy, the other directs it towards an enemy), eventually Goku, Vegeta and Tien are drawn into the battle, and yes, this is finally where the three-eyed fighter makes an impact. Tien shows off a few moves he hasn’t done since the original Dragon Ball series, but in general it’s still only half an episode, whereas Master Roshi has had several devoted to him, for example. Still, at least it’s something, which is more than he had throughout the majority of the DBZ series! This leads us to what was advertised as a one-hour special, but was actually just Episodes 109 and 110 airing back to back, after having aired no episode the previous week. That being said the focus of the two episodes was Goku fighting the super-powerful Jiren, from Universe 11. The battle starts with Goku slowly going up in power, from regular Super Saiyan through to Super Saiyan Blue, but failing to even make Jiren move. We then get a few high-speed fight sequences when Goku starts using his Kaio-Ken Super Saiyan Blue form, but even that fails to make even a mark on the bug-eyed alien’s skin. Goku quickly creates a Spirit Bomb from his team-mates energy (minus Vegeta, who apparently momentarily forgot his family’s lives were on the line and decided to not help out due to his… pride, I guess? Very old-fashioned Vegeta there!) but yes, even the Spirit Bomb is held at bay and deflected back at Goku, eventually consuming him and vanishing. Everyone is upset, Jiren isn’t disqualified due to Goku’s own attack killing him rather than Jiren himself (killing is against the rules, you see!) and then, of course, Goku returns with a whole new, super-powerful form! 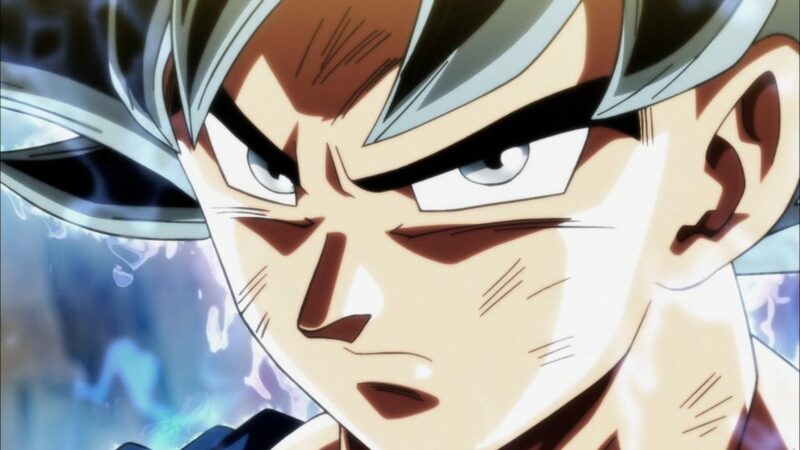 Coated in glistening white sparks and with weird grey and glittery eyes, Goku has apparently achieved “Ultra Instinct”, a form that even the Gods of Destruction find hard to accomplish. This leads to a wonderfully well-animated fight (complete with background music with lyrics!) where Jiren is pushed… momentarily. 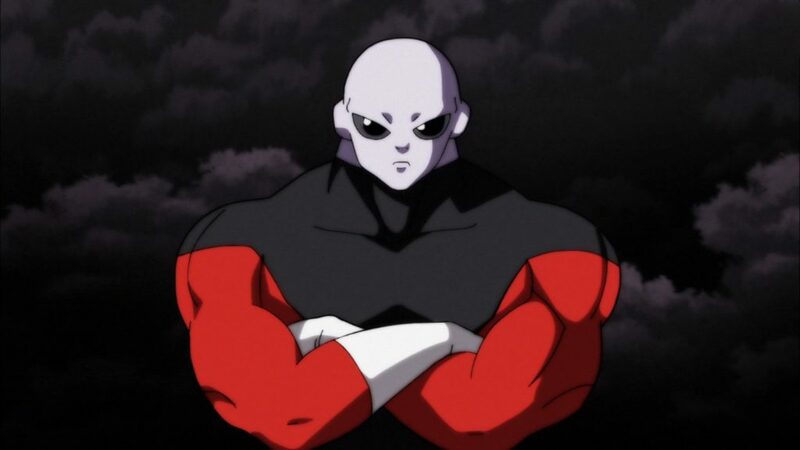 The form soon vanishes and we’re back to Jiren looking like an unstoppable beast. Episode 111 deals with the fallout, as Universe 6 assassin Hit almost eliminates Jiren with his Time Stop ability, only for Jiren to be “so powerful he transcends time itself”, whatever that means. It also features a fantastic call back to the Frieza arc of DBZ as the space tyrant himself repays a debt to Goku by giving him some of his energy, complete with the exact lines Goku spoke to Frieza way back when (though purely so he can live, rather than out of any kindness!) Believe it or not, the episode ends with the Grand Priest saying that the tournament has just reached the half-way mark. Yep. ONLY HALF-WAY. Next week appears to focus on Universe 6 Saiyan Cabba, who hasn’t actually done much yet, meaning we’re probably in for another bunch of episodes focused around one or two “lesser” characters, leading to a rematch between Jiren and Goku, who will probably gain the knowledge of how to use “Ultra Instinct” again. I don’t know if that means we’re in for another 15 weeks before the arc ends or not, but I guess the only way to find out is to continue watching! So Episodes 106 – 111 feel like the end of a chapter of this Arc. If this were the old FUNimation, where they broke up story arcs into mini “sagas”, this probably would have been the end of one. I’ll see you in six weeks time, probably to talk about six episodes focusing on the B-players again! …. Hooray? Maybe! The “Tournament of Power” continues onwards as Dragon Ball Super shows more fights, transformations and magical girl parodies than you can shake a stick at… oh and technically Episode 118 might have the highest death counter in anime history! Read on to find out more! 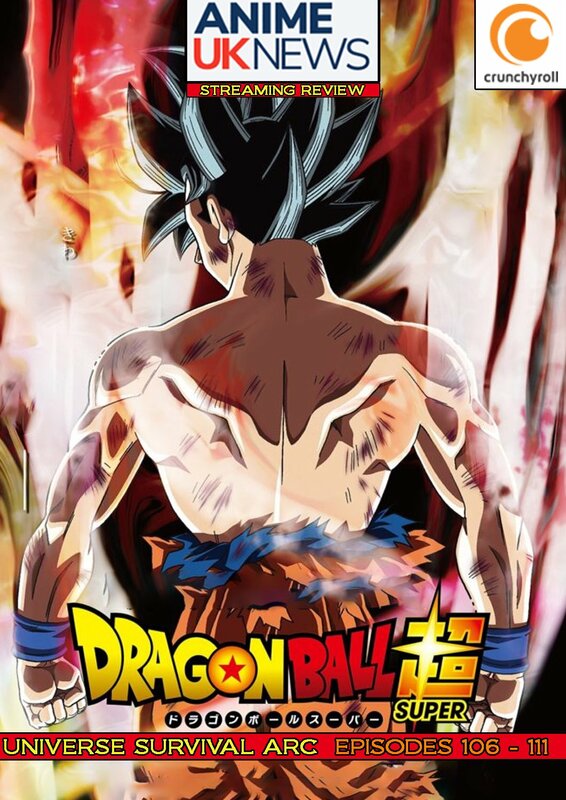 It’s been a long and crazy road since Dragon Ball Super began in July 2015, but now the series has come to an end (well, with at least one more movie to come, and an ongoing manga still being written…) What the Universe Survival Arc lacked in storyline it made up for in great, over-the-top action, and that still held true for this last block of episodes. So let’s take a look, shall we…!